Juvederm Voluma is the latest of the Juvederm range of hyaluronic acid fillers specifically designed to restore volume in areas of volume loss. Common areas include the cheeks, cheekbones, and chin. Additionally, due to its versatility it is also suitable for adding definition to the jaw line. 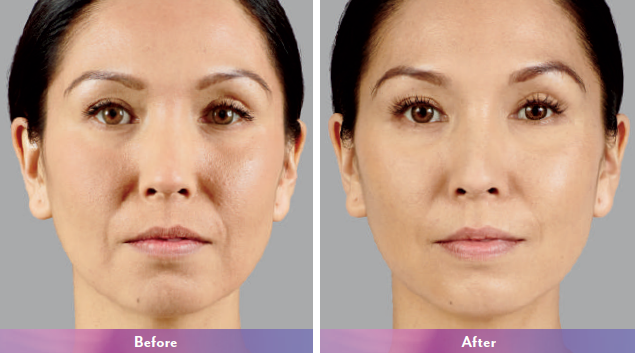 How does Juvéderm VOLUMA XC work to achieve its results? According to facial aesthetic expert Dr Herve Raspaldo, an attractive face is characterised by smooth, round contours, high cheekbones and a thin, well-defined jaw line. These features together comprise the 'triangle of beauty' or 'heart of face', with its base at the top and summit below. As we age, facial fat loss, gravity and loss of the skins natural elasticity conspire to reverse this triangle's composition, leading to a narrower, less youthful forehead and temple area, and a wider, heavier jaw line. JuvedermTM VolumaTM can restore balance and heart-shaped proportions to the face by subtly adding volume to areas where this is lacking due to the effects of ageing or extreme weight loss. The result is a restoration of the triangle of youth back to its original form resulting in a softer and more youthful appearance. Juvederm Voluma and carefully placed Botox along the jaw and neck works as a necklift and redefines the triangle of beauty. Which areas are Juvederm Voluma XC commonly used in? JuvédermTM VolumaTM is frequently used to revolumise the cheek, cheekbones and chin. As the filler is placed deep within the tissues, it adds support to the overlying skin and restore facial contours. How long does Juvéderm VOLUMA XC last? Clinical trials have shown that the volumising results of Juvederm Voluma can last for up to 18 months with optimal treatment (2-4 syringes of Voluma). This can vary from individual to individual.